On my C90 the hood did not help as the primary baffle is all ready a little to long. Because of this I did not include a hood in my test. Jim, no I didn't test that combination at the time. It would be interesting technically, but the hood (needing as it does to be as long or longer than the OTA) does make things rather cumbersome... At least for the daytime photography that was under consideration when I ran the experiement. In theory, a hood of the proper geometry (and an unreflective finish) should provide all the available stray light defence for the baffle tube. That takes care of wide angle interference. However, the interior walls of the OTA are simply flat black, and of course are not so effective at grazing angles. I can imagine that off-axis light just outside the field of view could scatter from the tube wall and onto the primary mirror, to then be mixed with the imaging rays. Hence it might be worth an experiment with light trap material here as well. It should be borne in mind that a hood to block direct sky light need not be quite so long as feared. If you make a simple cylinder of diameter equal to the main tube, it's needlessly wide and hence on the long side. 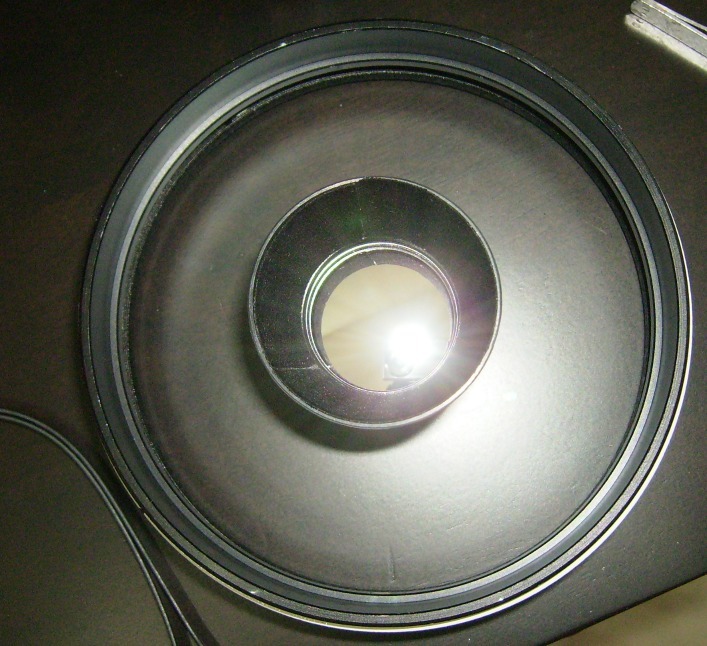 By making a baffle ring of diameter equal to the working aperture, and located at the very front of the hood, the hood can be made shorter. Moreover, that ring provides useful shadowing of the hood's inner surface, particularly the frontmost part immediately behind the baffle. Indeed, an additional couple or few baffles will provide even better shadowing. Glenn, surely there are ways to augment the stock baffling. A hood is impractical for me, anyway. It seems the single best improvement comes from the flocking inside the primary baffle. Flocking the visual back and diagonal seemed helpful. Im sure blackening reflective edges and surfaces help, too. At some point we reach the law of dimishing returns as we move further from axis. In my experience, flocking the primary showed a clear improvement in stray light control slewing across the sky with bright sources nearby. There may be a slight improvement with Jupiter and the moon in the FOV, but the most improvement was off axis bright sources, to include the moon. So much so many mods mentioned above are worth the effort. That being said, its curious to consider any off axis bright reflections from the shiney outside surface of the primary baffle. Such grazing reflections might strike the secondary and pose a threat. But the angle of incidence might be such the errant ray does not enter the primary baffle. Still, blackening it should mitigate any potential threat. I'm thinking of adding a few o rings to act as knife edges. This is a fascinating thread of discovery with real results possible for off axis bright sources definitely and on axis bright sources probably. One of the reasons that the 3.5 inch Questar was good on contrast, was the spring inside the primary baffle. A spring painted flat black, just the right size to slide into the primary baffle would provide many knifeedges. However, I am not sure that Ed's idea or Glenn's idea of the sandpaper or sawdust are not better. They are very, very effective. The later provides many more elements to block the light. In my 14 inch, I found 50 knifeedge baffles of variable I.D. and this many were required to do the job. Knife edges are nice. They are a little more complicated to fabricate especially for interior diameters where concern for vignetting becomes important. Flocking seems a suitable substitute. Do you have any pics on nighttime targets with and w/o the baffle mods? if not have you noticed any difference on nighttime targets? I know that the difference on the daytime is startling to say the least!!!! but I do wonder if a difference would be noticed on nighttime targets when there isn't as much stray light. When I finished mine, I liked it so much I got my dad one. We had them out looking, side by side at Jupiter and the difference was incredible. I didn't even feel like I was looking through the same scope. There was so much scattered light in his, about half the features and marks I could see in mine where hidden on his, lost in the glare of light. It's not the optics either because once I did his, they look the same. There was even a small difference on M42. Well, here's a Criterion 4000 put to good use! For the C90, the yard stick test indicates a 10" long dew/light shield is required--works well! As Glenn mentions, a ring baffle can also be inserted at the end of the shield. I did the painted sand paper main baffle, biggest improvement. When done, I found that the inside of the secondary baffle caused the next largest amount of stray light, it's the reflection of the secondary mirror that's seen there. I glued a crescent-shaped piece of flocking paper into it and it killed that reflection. I haven't bothered with the ring of exposed secondary around the secondary baffle. My little Maks have now just as much contrast as my Questar broad-band, and I'm happy. I have both an Apex 90 and a C90 Mak that are similarly modified, the only difference between the two is that the inside of the Apex 90 main tube is flocked, and the C90 isn't. With the dew/light shield, I don't find that I need to flock the inside of the C90 main tube. I also did the same flocking to my Apex 127 Mak, with very good results. For this one, I am still looking for a suitable dew/light shield. Yard stick test indicates 12" is required, and the Orion FlexiShield I have isn't long enough. Considering how little it would cost a manufacturer to properly baffle its scopes, I have to wonder why they don't. Of course, that's true of any facet of scope design and construction -- metal instead of plastic gears and bearings, beefier forks and tripod legs, better wiring and connections, etc. I think most of us would be willing to pay a bit more to get something that not only works right from the get-go, but also gives continuing enjoyment over the long term. Honestly, what would it cost for a manufacturer to adequately baffle a $1000 or $2000 scope by inserting a spring made of flat wire? Another five bucks? Think of the marketing advantage for a company which could claim it designs and builds its products with care so they perform better than those of the competition. What do you mean by "the yardstick test?" How does that determine the optimum length of the dew/light shield? Personally, I'd rather attach an extended dew/light shield, insert flocking into the primary baffle and be done with it. I don't want to open the OTA on these Maks and SCTs. They aren't as straight-forward and easy as Newts. I don't want to risk ending up with internal collimation being not as good as when the scope left the factory. It's not the same thing as just adjusting those three little screws on the back of the secondary mirror. Many experienced Cat users feel the same way. But believe me (I've dismantled several SCTs completely), if you work slowly and carefully, these can be dismantled and reassembled as easily as doing the same to, say, a 6-element eyepiece. I did that with an Erfle eyepiece back in the '60s, darkening the lens edges and flat blackening the shiny interior of the eyepiece barrel, and it improved contrast in that eyepiece by a LOT. When I did the same thing to an 8" SCT, it also made a noticeable difference. the biggest difference can be seen by flocking the inside of the tube, the inside of the secondary baffle, and the inside of the primary baffle. The latter two require opening the tube, though not necessarily from the bottom. But believe me (I've dismantled several SCTs completely), if you work slowly and carefully, these can be dismantled and reassembled as easily as doing the same to, say, a 6-element eyepiece. Oh, that easy? Shucks, I dismantle and reassemble a half-dozen Erfles every Sunday afternoon just for fun. Seriously, I wouldn't want to try that either. Not my idea of easy. Now, working on Newts IS easy! I did that with an Erfle eyepiece back in the '60s, darkening the lens edges and flat blackening the shiny interior of the eyepiece barrel, and it improved contrast in that eyepiece by a LOT. When I did the same thing to an 8" SCT, it also made a noticeable difference. the biggest difference can be seen by flocking the inside of the tube, the inside of the secondary baffle, and the inside of the primary baffle. The latter two require opening the tube, though not necessarily from the bottom. After you've operated on a Cat, can you be sure the collimation is at least as good as factory? There's a lot going on in a Cat that's not as easily checked out and collimated as the primary and secondary of a Newt. Some posts by Uncle Rod and others on this topic have made me think twice about taking my Cats apart. When I did the same thing to an 8" SCT, it also made a noticeable difference. 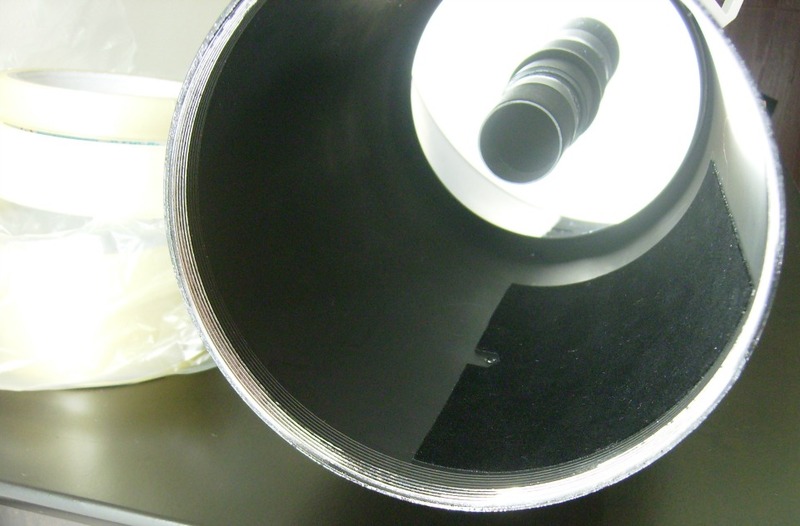 the biggest difference can be seen by flocking the inside of the tube, the inside of the secondary baffle, and the inside of the primary baffle. The latter two require opening the tube, though not necessarily from the bottom. I don't think you need to open up the OTA to flock the primary baffle. That can be done from the rear opening. After you've operated on a Cat, can you be sure the collimation is at least as good as factory? There's a lot going on in a Cat that's not as easily checked out as the primary and secondary of a Newt. Some posts by Uncle Rod and others on this topic have made me think twice about taking my Cats apart. 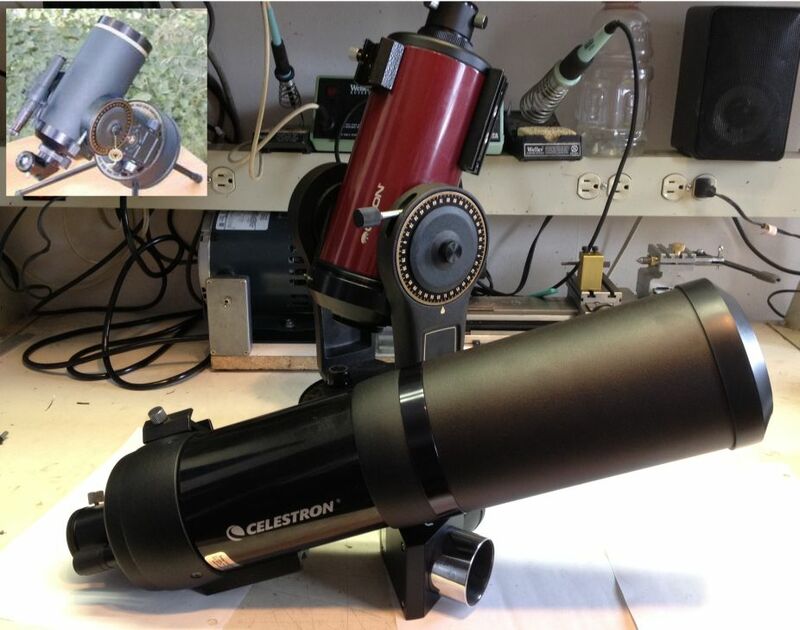 There are only a few things to check for collimation in an SCT, and some of them are poorly set up at the factory. I fixed one that had a cross-threaded primary baffle in the rear cell so the baffle didn't point at the center of the secondary! I've seen a lot of them in which the corrector wasn't centered in the tube, nor the secondary centered in the corrector. Reassembly is a matter of threading the primary baffle back into the cell scrupulously perpendicular to the cell, centering the secondary in its cell, centering the secondary cell in the corrector, then centering the corrector in its cell. The "seat" the corrector sits on is sometimes foam, which deteriorates and causes the corrector to stick in its cell as if glued. A thin sheet of non-compressible sheet, cut into sections, is superior. In many ways, SCTs are made to a price, not optimally. After reassembly, the only thing that can be collimated is the secondary tilt, and the mirror is spherical, so doesn't have a center. So long as the registration marks line up, it's pretty straight forward. Reconnecting the focuser was the hardest part because slight angle errors can easily result in binding. Early Meades centered the corrector with small plastic pieces that were slightly curved [think ")" ]and acted like springs on the edge of the corrector--excellent. The cork shims on other SCTs tended to be missing, misplaced, or deteriorating from mildew. I used small polyethyene sheet fragments cut into tiny pieces, and used 6 of them so the centering of the corrector was stable when I was replacing cork. 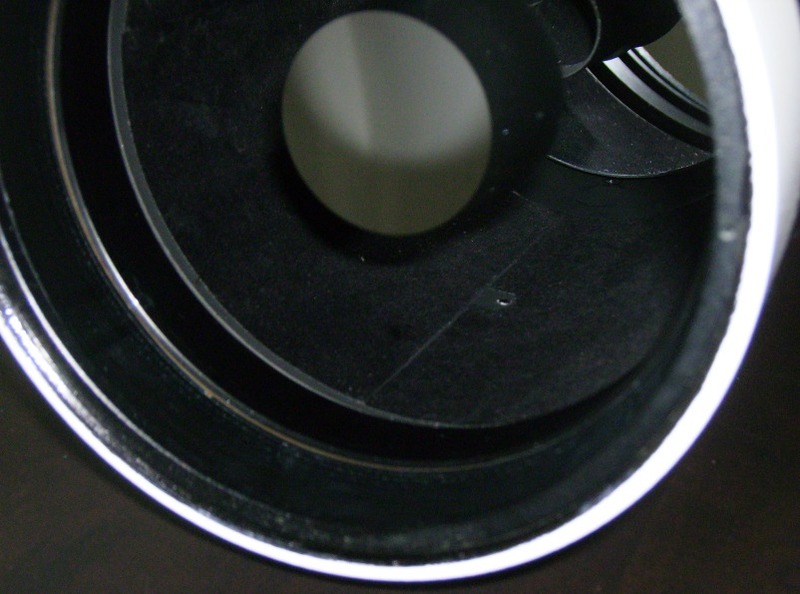 My Meade had a deeply-threaded interior to its primary baffle, but still wasn't as well-baffled as the later Meade LX200 14", which had a series of knife-edge baffles at regular intervals running down the baffle's interior. That scope had better contrast than the other sizes, I thought. Though I never did it, some modifiers added a spring behind the primary to keep it pushed forward against the focuser screw to reduce image-shift when focusing. I found a very thick grease in between the two primary baffles did the trick. With Meades, you could adjust the focuser to reduce image shift. With Celestrons, it was the grease that did it. The 'yardstick' test is to determine how long to make the front light shield. While peering up into the rear opening, and from as far off axis as possible, a stick placed against the side of the OTA is pushed foreward until the end just dissappears from view behind the secondary baffle. The distance the end of the stick extends beyond the OTA's front end is the length the light shield must extend; this will ensure that no direct sky light can get through to the focal surface. I found that on a Synta-made spot-Maksutov Cassegrain, removing the corrector meniscus cell has very little effect, if any, on the collimation (provided you put it back on). 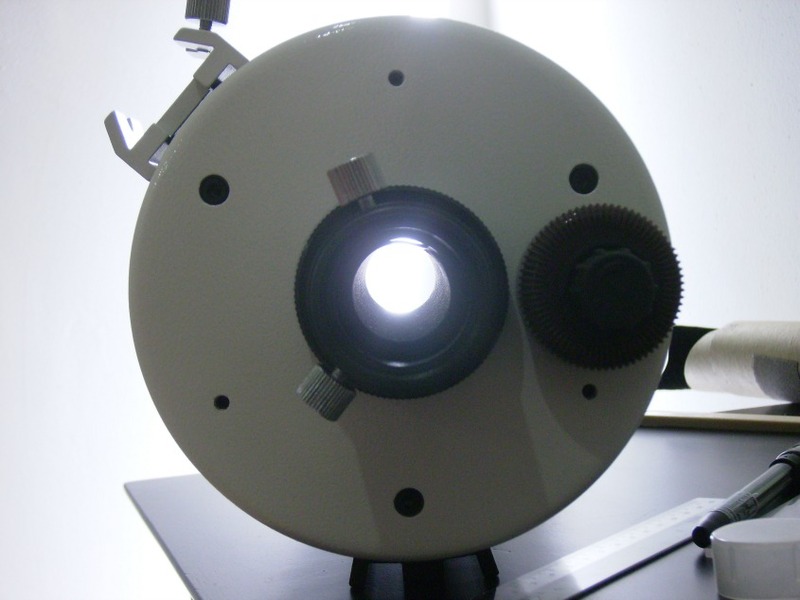 I have also removed, cleaned and remounted the corrector meniscus on a Questar without degradation of the collimation. This is definitely not the case for a Schmidt-Cassegrain, where the corrector plate has to be centered as well as oriented correctly, and the secondary adjusted. But Maksutov's are more forgiving. The 'yardstick test' (is it Glenn who coined the term?) indicates that for a C90 (and Apex 90) the light that can make it between the secondary baffle and the primary baffle originates from a direction that corresponds to about 10" past the edge of the tube on a C90. In other words, light coming from a wider angle is blocked by the primary baffle and light coming from a narrower angle is blocked by the secondary baffle. Ed Holland has posted here a method for collimating a Synta Maksutov, and that is also the method I use with very good results. Now, I have been involved with designing, building, troubleshooting and occasionally destroying optical systems since 1988, both in the private and academic sector. So you might understand why I don't hesitate to play with my toys... As Make magazine puts it, "If you can't open it, you don't own it!" Cheers! I have an old 90mm MCT - the flip-secondary-mirror kind - that has developed primary mirror flop when the OTA is pointed toward zenith. Probably the grease needs to be replaced. I might take apart this little Mak first before I think about operating on any other Maks or SCTs I own. I might take apart this little Mak first before I think about operating on any other Maks or SCTs I own. Should be easier to 'operate' on... Let us know how it goes, whether or not the patient survives! BTW, this kind of grease is great, have been using it for years! I noticed there are small ridges or threads in the baffle tube. How do I apply flock to this area ? Will the lack of smooth surface make the adhesive peel off years later ? The small 27mm tube seem really hard to lay the adhesive strips directly and I wouldn't want a rolled insert to slip towards the secondary mirror spot. Edited by hardwarezone, 25 August 2014 - 05:08 AM. Zone, I just carefully cut to fit a piece of flocking paper, rolled it, and slipped it in unglued. Once you press it flat, and hopefully the edges will meet and hold it's form, friction will hold it in place nicely. It took a little trial and error to get it cut just right. Measure first, cut it a little large, then trim until it fits nicely. I flocked my 127 yesterday. It was bad that there was a thumb sized patch of haze on the mirror. The scope is new and imported, so I tried to clean it myself rather than pay another 30% cost return freight for a refund. The dealer was kind enough to promise accepting it even if I screwed up the cleaning process, but I know that won't happen because of high freight cost. Good news, it came off easily with distilled water and cotton. Not fungus. Bad news, there remained minor watermarks and I tried to clean it another round in panic, spreading the mess and making at least 2 or 3 small sleeks. I'm sore about this experience, but I remind myself that I got it at a good price and should get the most use out of it rather than worry about any potential effect on resale value. 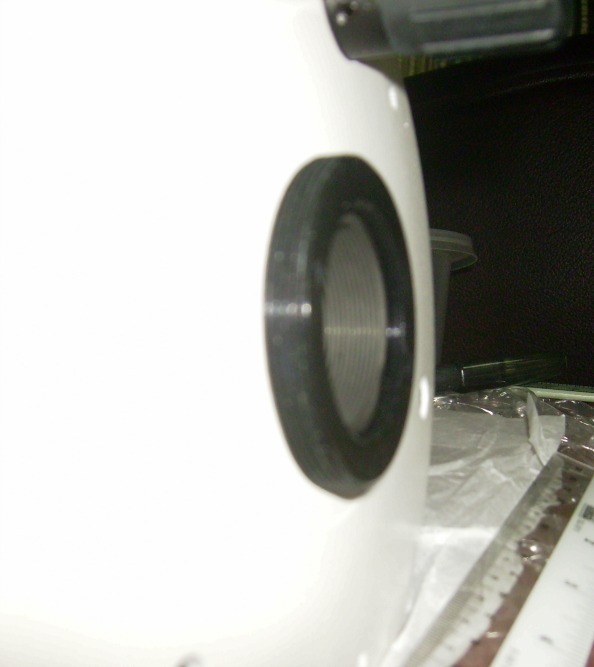 The secondary baffle is 51.5mm at the widest point. I made a paper template of the rainbow shape and traced it onto my flock for the final cut. Eliminated the weakest fur with a few rounds of stickytape. Camera flash on the second photo. Easy to apply in 3 sections. I applied the adhesive-backed nylon flock to a thin piece of plastic file cover. It unrolled easily, made a little mistake by cutting the circumference too short, now it clips the light path. Focuser mod is a milk bottle cap. Almost no difference in actual usage. Tube wall in 4 sections. The mirror travels approximately 17 to 22mm from the tube opening. My flock was cut to length 160mm x 430mm circumference. 2cm gap away from the mirror and nearly 1cm shorter in circumference. Tube wall is easy to flock too. The meniscus cap on my OTA is hard to twist off, putting it back is even harder, there is resistance to turn. Note the threads must be equal 3/3 on the top and bottom to avoid cross threading. Tried to test it this morning 10am with a 10inch dewshade. It could be the angle of the Sun or atmospheric conditions. My camera is an old point-and-shoot. Held over a 32mm plossl by a tripod. I forgot to refocus the telescope for this shot. Edited by hardwarezone, 07 September 2014 - 09:41 AM. Technically, the curvature you see in the field of the 32mm Plossl is called rectilinear distortion. 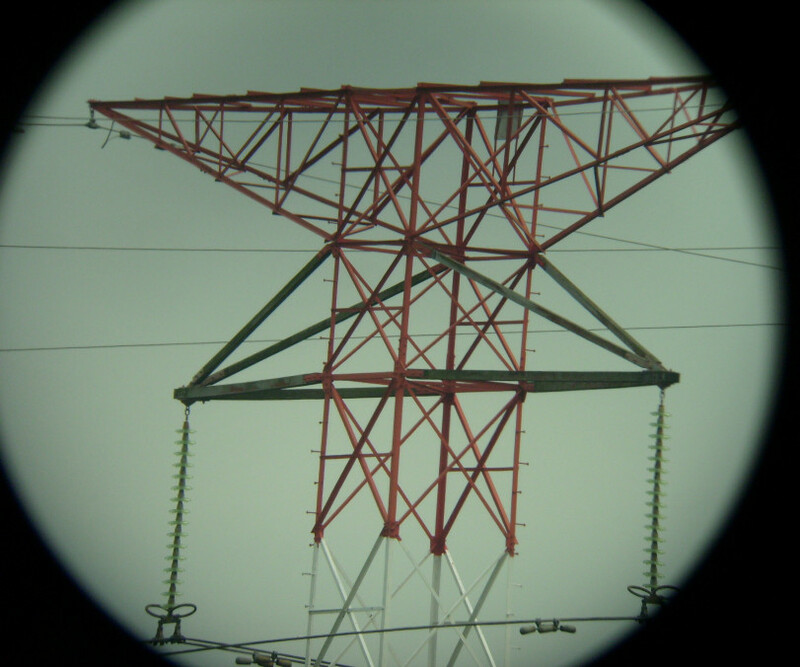 In this case, the curvature of lines is inward so it is the RD known as pincushion. Field curvature would be when the actual focal plane surface is shaped more like the surface of a sphere, and either the outer edge of the field would focus closer to you than the center of the field, or farther away. Your entire field looks to be in good focus, so whatever FC is present must be negligible. 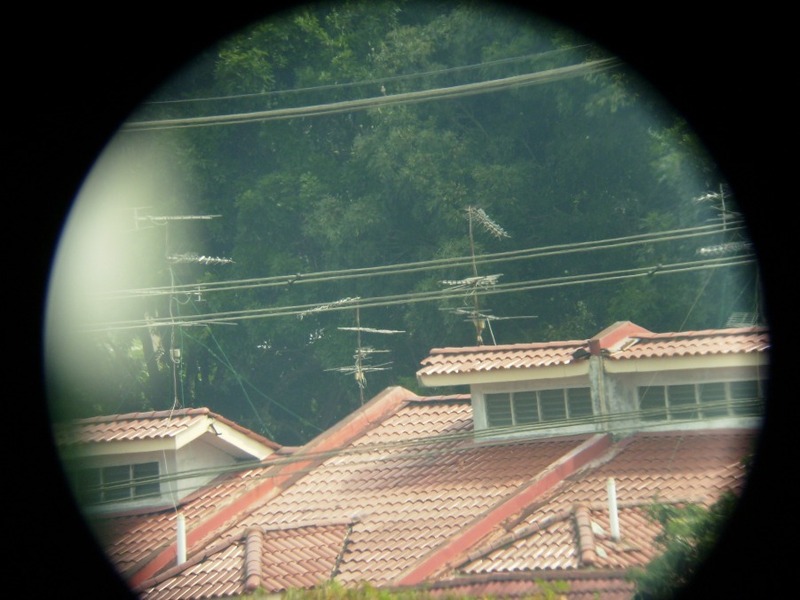 The amount of pincushion, for astronomical eyepieces, is also quite minor--wider field eyepieces typically have even more curve to straight lines at the edge. All your pictures also show that there is a bit of vignetting (light drop off) near the edge of the field. This could be in the scope, the eyepiece, or a combination of the two, but it is not a large percentage of the field and is unlikely to be seen at night. 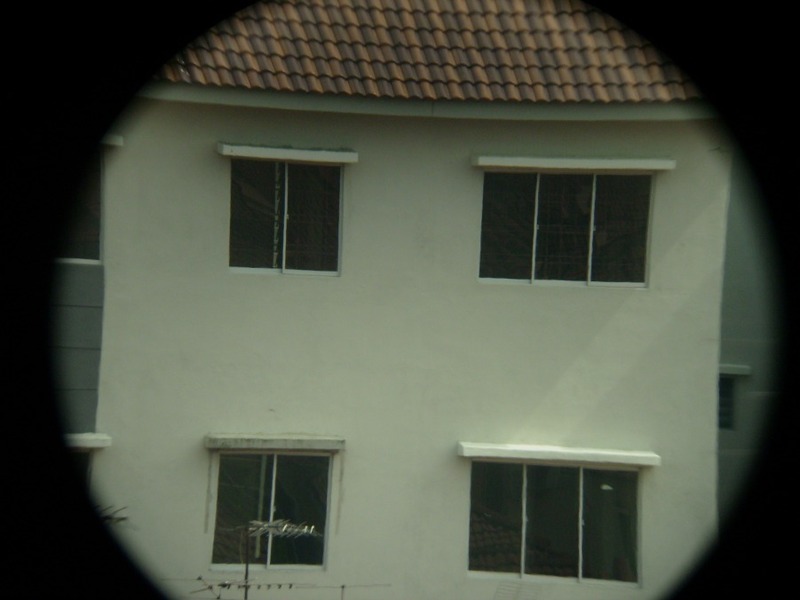 I think it is in the scope, because mine exhibits the same thing with multiple different eyepieces. That you didn't notice a tremendous difference after flocking probably shows there was good baffle design on the part of the manufacturer. I just wish they had used a larger diameter primary mirror. Rays from the edge of the corrector miss the mirror (which is why the Sky and Telescope article mentioned that it's really a 121mm scope). Nonetheless, the images are sharp and clean, and you will enjoy using the scope. I've owned mine for 11 years now, and am not inclined to sell it. (4) L = (WB + Wb - cB -IB) / (C - I), should be: (4) L = (WB + Wb - cb -IB) / (C - I). Edited by Jeff B1, 07 September 2014 - 10:14 AM.